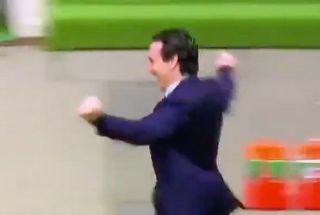 Unai Emery took a page out of Arsene Wenger’s book with this uncanny celebration after Arsenal’s opening goal against Tottenham. After Aaron Ramsey gave the Gunners the lead at Wembley, the Spanish tactician couldn’t quite hide his joy, as seen in the video below. As commented on in this tweet as well as by many other Arsenal fans, it looked eerily similar to Wenger’s old lap around and clenched-fist punching celebration that we saw for many years on the sidelines during his time with the Gunners. Emery appears to have studied the Frenchman a little too closely based on this, but if Arsenal can secure the win and go on to achieve their objectives this season, fans will surely have no issues with seeing it over and over again.